In preparation of the new Open Enrollment season, we looked at the state of Spanish healthcare terminology in more detail. 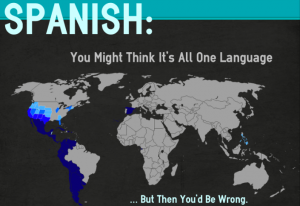 In researching 6 major organizations, both government and private, it can be confirmed that Spanish Healthcare Terminology is vastly complex and not always very consistent among different government and private organizations. Part 1 discussed the glossaries we researched. Part 2 discussed the usefulness of the glossaries available. This is Part 3 of our series on Healthcare Terminology for Healthcare Translations. By bringing the different glossaries together into one overview, we get an idea of the consistency and quality of the information in Spanish that is being produced by these major healthcare organizations. Below are some examples of our findings. Our work of harvesting existing healthcare translations and terminology produced a total of 775 English and Spanish terms that came from these glossaries and we compared these against our own glossaries and our industry knowledge. We can conclude that quite a lot of the basic language is well covered. 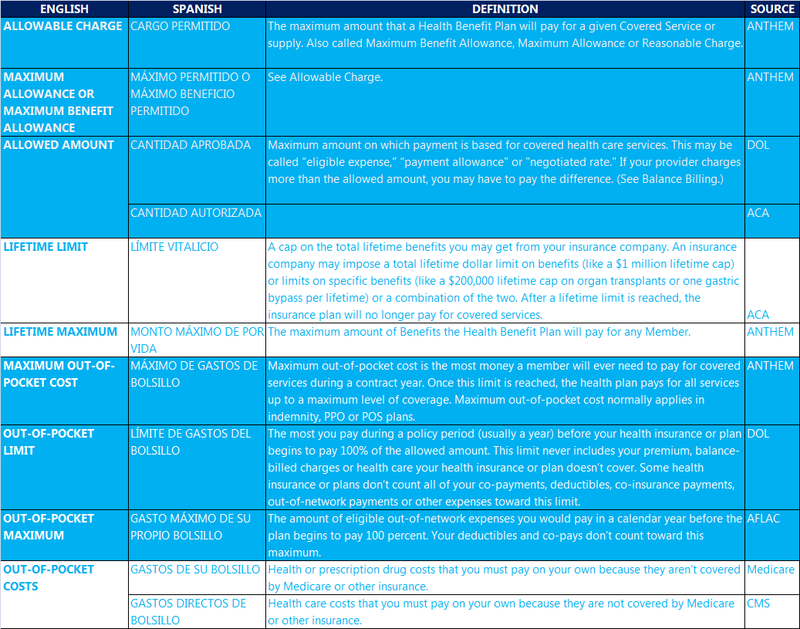 Terms like network (RED), claim (RECLAMACIÓN), cost sharing (COSTO COMPARTIDO) and deductible are all in agreement. Coinsurance is is either coseguro or coaseguro and both are correct, but we prefer coseguro. 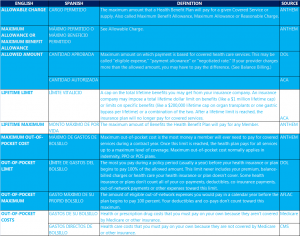 To illustrate the complexity of English and Spanish healthcare terminology, this overview merely explains 4 unique insurance concepts! Click to enlarge. As the English terms from different organizations were compiled, the evidence of the complexity of healthcare coverage terminology was clear. Here is an example: Terms such as Lifetime Limit, Lifetime Maximum, Maximum Allowable Cost, Out-of-Pocket Limit and Maximum Out-of-Pocket costs could all mean the same without additional explanation. ACA uses Allowed Amount which seems to relate to Anthem’s Allowable Charge. Both Anthem and ACA define 3 English synonyms for the same term and every one of them is different from the other organization! Anthem uses Lifetime Maximum whereas the ACA site talks about Lifetime Limit. Anthem defines Maximum Out-of-Pocket (Máximo de gastos de bolsillo) as the most amount a member will ever need to pay for a covered service during a contract year, whereas the Department of Labor’s standardized term is Out-of-Pocket Limit (Límite de gastos del bolsillo), whereas AFLAC uses Out-of-Pocket Maximum (Gasto máximo de su propio bolsillo). Finally, Maximum Allowable Cost does not have anything to do with medical expenses, but with reimbursement for prescriptions. The result is that there are also quite a few Spanish terms available for the same insurance concept, dependent upon with whom you talk. The overview on the illustration above is the compilation of all terms we found to explain just 4 insurance concepts. Imagine the headache if you don’t manage these terms consistently in benefit enrollment packages. As much as we can assume that Proper names are standardized, this doesn’t always seem to be the case in Spanish. We found many inconsistencies in translations of Government sponsored programs. Programs like Federally Qualified Health Center has three different translations among CMS, Medicare and Anthem. CMS and Medicaid don’t seem to agree on the term for PACE (Program’s for all-inclusive care for the elderly), even after CMS seems to have adjusted it in their 2016 Model Document glossaries to more closely match the Medicare term, but not exactly. 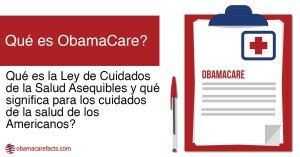 Not even ACA’s (aka Obamacare) biggest private advocacy website can agree on the Spanish translation of the program. Even the translation of Affordable Care Act cannot be agreed upon. ACA uses LEY DEL CUIDADO DE SALUD A BAJO PRECIO, whereas AFLAC uses ATENCIÓN MÉDICA A BAJO PRECIO. Both seem to highlight the idea that you can get healthcare at a low price (bajo precio). The more accurate and suggested translation is LEY DE CUIDADO DE SALUD ASEQUIBLE. However, the popularity of Healthcare.gov in Google seems to suggest that the ACA term may win it over as the more accurate program name. In this case, it may be best to refer to the ACA as it is provided by the program even though we have found many different translations. Worker’s Compensation is a fairly standard program offered in health plans, but we found that ACA uses both SEGURO DE ACCIDENTES DEL TRABAJO and COMPENSACIÓN AL TRABAJADOR. 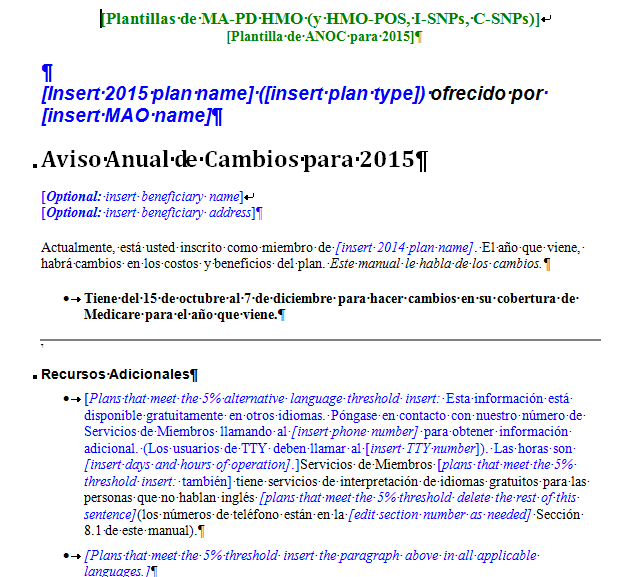 CMS seems to agree with the first term, whereas Medicare uses COMPENSACIÓN LABORAL. We actually prefer to use SEGURO POR RIESGOS DEL TRABAJO as this is a well understood term in most countries. The preference over one term over the other also seems to be related to regional differences that cannot always be avoided. As a final example, HIPAA has different translations for both portability (TRANSPORTABILIDAD vs PORTABILIDAD) and accountability (RESPONSABILIDAD, which is the correct term, but we also found CONTABILIDAD which means accounting/bookkeeping, not accountability). Portabilidad and Transportabilidad are terms that are very similar, but our preference is to use Transportabilidad. This term describes better the TITLE I provision to allow easy portability of health plans from the old employer to the new one or in case of loss of a job. LEY DE TRANSPORTABILIDAD Y RESPONSABILIDAD DE SEGUROS DE SALUD would be our choice of wording. Much of the remaining variability is minor and often contains synonyms. We found many terms where word order seems to differ, but at least the terms are consistent. Physical therapy in CMS documents is referred to as TERAPIA FÍSICA whereas Medicare calls it FISIOTERAPIA; both are correct. Preauthorization is also known as prior authorization. Some seem to use AUTORIZACIÓN PREVIA, others use PREAUTORIZACIÓN or both. Inpatient is either CUIDADO INTERNO or PACIENTE INTERNO, where the object is either the care or the patient. Finally, some terms are more appropriate than others depending on regional preferences. A good example is the term Disability. The term DISCAPACIDAD that Anthem is using is generally considered a socially more acceptable term over the word INCAPACIDAD that ACA uses, although there is some regional variation of the preference. These regional preferences also make total unification of healthcare terms more difficult as the United States tends to follow the preferences in demographics of the population. In general, that means that States in the west and southwest typically tend to have a Mexican preference, whereas States on the east coast tend to prefer influences from Puerto Rico, Costa Rica and the Dominican Republic. So while we have found that there are inconsistencies for terminology in English, the inconsistencies in published Spanish healthcare translations is even greater. You can see our overview of services we provide in healthcare translations here. Read on in our 4th part conclusion on this study in healthcare terminology.